Why does Google owe the EU $5 billion? After the better part of three years' investigation, the European Union has announced that it will fine Google €4.34 billion ($5 billion). The company was found to have restricted competition through the use of its dominance in the mobile market. Officials believe that Google's business practices, including using Google Play rules to block manufacturers forking Android, is an abuse of its power. The Commission also believes that financial incentives were used to ensure that they "exclusively pre-install Google search on their devices." The fine is the largest in European Union history, dwarfing the €2.4 billion penalty handed out to Google in 2017. Confused? Let us help you get all caught up. What has Google done wrong? The EU believes that Google has abused its dominant power in ways that are designed to crowd out other businesses. Officials say that since 2011, the company has "imposed illegal restrictions on Android device manufacturers and mobile network operators." These restrictions have ensured that Google has been able to "cement its dominant position in general internet search." Officials say that the search engine has "made payments to certain large manufacturers and mobile network operators." The payments are allegedly intended to ensure that carriers only installed Google Search on their devices. And since users are often satisfied with their default option, Google's products remained the most used across the continent. The other part of the charge relates to how Google ships versions of Android to the manufacturers who put it on their devices. There are, you see, two different flavors of Android, "Android GMS (Google Mobile Services)," and "Android AOSP (Android Open Source Project.)" Android GMS is the flavor you're probably familiar with if you own a handset from a brand-name manufacturer. Now, there are two things that you'll find on pretty much every GMS device: access to Google Play, and Google's core apps pre-installed. So, instead of a generic browser and email client, you'll find Chrome and Gmail there on the home screen. That's not a coincidence, because if you don't have those pre-installed, you don't have access to Play. AOSP, however, as the open-source version of Android, doesn't come pre-installed with Google's apps. And, as a consequence, doesn't have access to Google Play, reducing the ability for users to easily download new apps. But AOSP has been tweaked by numerous developers, especially in lower-cost handsets, as well as for specific commercial applications. The EU feels that by withholding Google Play on the condition of using GMS, it has essentially ensured that the majority of Android handsets have Google's blessing. And, in doing so, enables "Google to use Android as a vehicle to cement the dominance of its search engine." Officials can even cite an example: Amazon's Fire tablets run an AOSP fork called Fire OS which lacks access to Google Play. Instead, you have to use Amazon's own app store and services with the platform, which runs on Amazon devices. But apparently, there was interest from other manufacturers who may have wanted to use Fire OS on their own hardware, but were prevented from doing so by Google's licensing deals. It is, and this is probably one of the hardest and most complex issues that has to be wrestled with. Because Google has to guard its own business, the security of its users and the integrity of the Play store, there is logic to keeping them separated. On the other hand, because of Google's size and reach, it can appear to be something closer to a threat than a promise. Use Android, the company says, but you'll have to play by our rules if you want it to work with the most popular services in the world. Not to mention that the GMS lock-in ensures that users often stick with the defaults of Chrome and Gmail. And, again, the EU Competition Commissioner believes that money changed hands to ensure that Google Search was the only search offered on certain products. That, combined with the contractual terms that mean manufacturers can't build rival platforms based on AOSP, makes it look pretty shady. Google has been in trouble with the EU before, hasn't it. Yes, and last year the search engine was slapped with a €2.4 billion fine regarding perceived abuses of Google Shopping. When you search Google to compare products, its own price comparison tool is prominently displayed within the results. 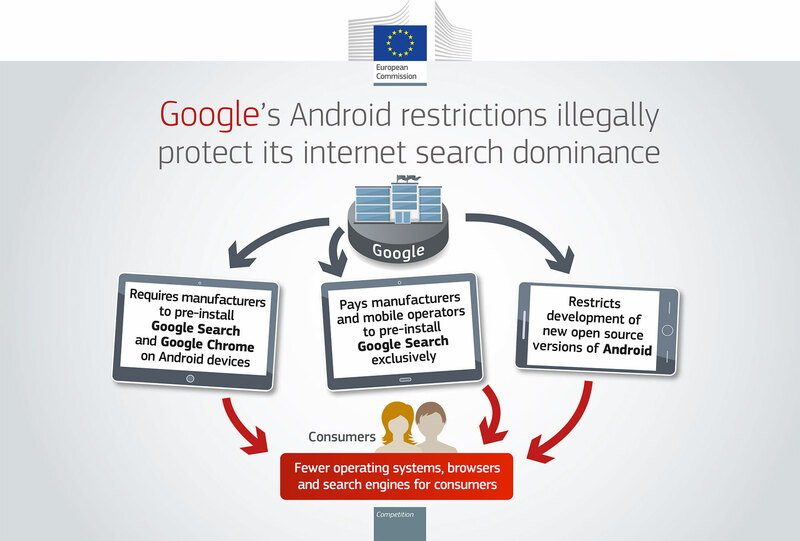 The EU believed that doing so enabled Google to steer users away from rival comparison portals. Back in 2016, Google's Kent Walker said that the EU has both misunderstood the mobile market and how Google operates. "Android is not a 'one way street,'" he wrote on Google's policy blog, but "a multi-lane highway of choice." Walker also tackled the topic of licensing payments, saying that bundling Google Play and Google mobile apps lets it offer the apps "for free." Another big objection was that the EU didn't consider iOS to be a competitor product for Android, whereas pretty much everyone else thinks that it is. Walker also said that without Google's intervention, Android would become fragmented and unusable. The EU disputed that in its findings, saying that Apple devices are aimed at a niche market of wealthier buyers, and doesn't constrain Google, since those handsets also use Google Search. Will this hurt Google / Alphabet's bottom line? The EU has a complicated way of calculating fines that includes looking at the size of the market and a limit of no more than 10 percent of annual revenue. In the first quarter of 2018 alone, Alphabet (Google's corporate parent) brought in $31 billion and made a $9.4 billion profit. The fine will make some Alphabet accountants hide under their desks for a week, it's not going to hurt Google in the long term. What will happen to Android? Illegal payments conditional on exclusive pre-installation of Google search. Illegal obstruction of development and distribution of competing Android operating systems. What that will look like is going to be interesting and it may mean that Google could be forced to offer Play Store access to AOSP devices. Google has always maintained that doing so would be difficult because of increased hardware and software fragmentation. The EU, however, says that Google's objections on a technical level don't stack up, saying that it "did not provide credible evidence that Android forks would be affected by technical failures or fail to support apps." It remains to be seen, therefore, if Google was making more of Android's limitations than in reality, or the EU has greatly overestimated Android's capabilities. On the GMS front, it's likely that Google can simply offer a pop-up to appear during setup that would offer users the choice of alternative mail and browser clients. This already happens in Russia, where you're asked if you'd prefer to use Chrome, Yandex or Mail.ru. And that was remedy enough to allow Microsoft to continue operating back in the heyday of Internet Explorer. Much like with Microsoft, Google is now firmly in the European Union's sights, and that's going to be an issue in the future. Because, like Microsoft, Google's size and reach means that it will always have to think about how its business moves play out in the EU. Microsoft spent years treading on eggshells in Europe, always at risk of a massive fine if it -- like when it stopped offering a choice of internet browsers in Windows 7 SP1 Updates -- breaks the rules again. Why is the European Union involved? The European Union is, at its heart, a massive, continent-spanning body that is designed to ensure that the free market remains a free market. It watches companies go about their business and, if it spots something that could distort the market, it investigates. When a business gets too big, and can start throwing its monopoly power around to suppress competition, the EU can step in with fines. Big Tech has often found itself clashing with the EU, which is significantly more proactive and thoughtful than its US equivalent. Through the late '90s and early '00s, the European Commission (which is the administrative arm of the EU) battled with Microsoft over both server tech and streaming media. The body later made Microsoft offer users a choice of browser rather than defaulting to Internet Explorer. The issue in those cases were if Microsoft was abusing its power to block competitors from using rival technologies. These days, the song remains the same, but the lyrics have been re-written to talk about the new behemoth in the tech world: Google. It is, after all, one of the three biggest technology companies in the world, and the EU says that it controls 80% of the smartphone market in Europe. And the countries that make up the European Union, combined, represent some 508 million people. That makes it a bigger potential market than the US and Russia put together, and one of the wealthiest. If you want to do business there, you have to play by the EU's rules, which are all about high standards. Google has been given a deadline of 90 days to "bring the conduct" -- the three numbered violations -- "effectively to an end." If it does not, the company will face a daily fine worth around five percent of Alphabet's daily turnover. In a statement, Google has already said that "Android has created more choice for everyone, not less. A vibrant ecosystem, rapid innovation, and lower prices are classic hallmarks of robust competition." It added that, as expected, "we will appeal the Commission's decision" In an open letter, Google CEO Sundar Pichai echoes those points and reiterates that the company will fight this.